What will you find at the Market Tomorrow? The February Bream Creek Farmers Market is tomorrow, and there’s a fantastic range of stallholders joining us at the Bream Creek Showgrounds. Buy your dinner and fresh produce, stock up the pantry with preserves, and grab a bite to eat and a fantastic coffee and let the kids have some good old-fashioned fun playing with homemade playdough, it’s a great community event with so much to do! Dunalley Primary P & F – the Dunalley Parents and Friends Association will once again be cooking up gorgeous snacks and wholesome meals. They use locally sourced produce and are raising money for the school rebudiling project. Come and support a fantastic cause and get some fabulous food at the same time! They are operating from the P&F Hut. J. W Kirwood Orchard – gorgeous summer fruit, including cherries, blueberries, greengages, apricots and peaches. Mike is also going to be selling jams and sauces made from his lovely fruit. Joan’s Juices – thirst quenching, fresh fruit juices made to order, absolutely delicious. Ron and Jill Harris – vegetable seedlings grown locally and hardened to local conditions. Little Quion Farmhouse, Michael & Jenna Gray – vegetables, herbs, preserves, ready-to-eat pork rolls with apple sauce. Michael and Jenna will also be taking meat orders for their organic free range pure berkshire pork at the market. Gabe’s Poo – Gabe will be selling cow manure on the Ute Line, fantastic for your garden. Inner Pickle, Tom Westcott – Traditionally cured, fermented and preserved goods, including kimchi, saukraut, pickles, cured fruit and vegetables and lots more. Beanyard Coffee, Pat Burke and Dougal Harris – fresh espresso coffee, using beans roasted in Tasmania and homemade biscuits. Gillespies Ginger Beer, Sam and Alison Loney –delicious ginger beer made locally at Bream Creek. Madhu Lilley – selling handmade soap using olive and coconut and essential oils. Charla’s Bush Honey – honey from Charla Sweeney. 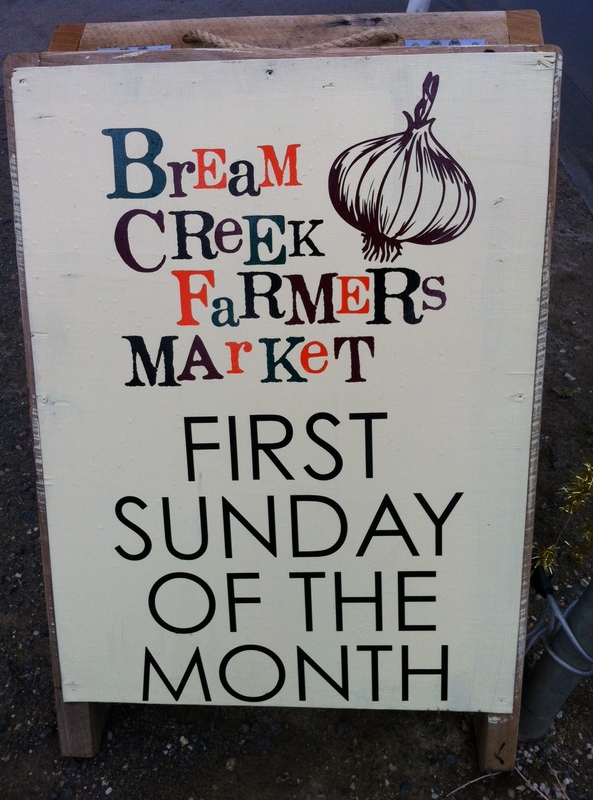 « It’s SO EASY to be involved in the Bream Creek Farmer’s Market!